With this twentieth anniversary salute, we honor one of the most polarizing, yet commercially successful, major label debut albums in modern Hip Hop history. This blond-haired, blue eyed emcee from the D was making a lot of noise in their underground scene with efforts like Infinite and The Slim Shady EP. Widely regarded as a lyrical monster, this guy had cosigns from several notable acts including Jersey’s The Outsidaz. It was this noise that was made that prompted him to be a part of the Rap Olympics, and from there he caught the ear of the almighty good Doctor himself, Dr. Dre. The rest, as they say, is history. Signed to Aftermath, we knew this would be a changing of the guard, but we didn’t know to what capacity. We had no idea the impact would be to where it has become. It all started from this controversial album. 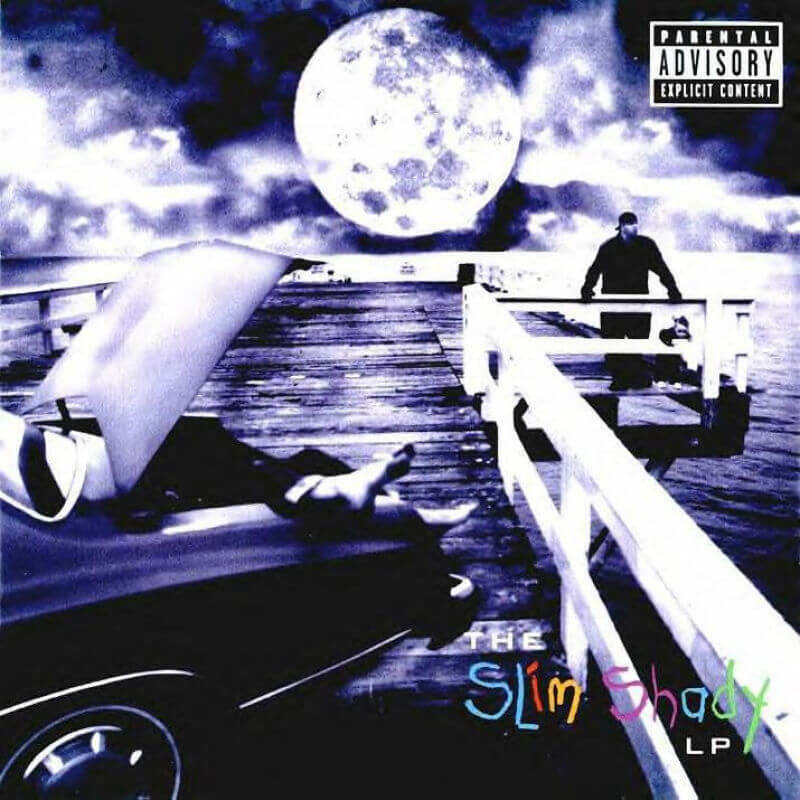 Ladies and gentlemen, we salute Eminem and his debut major label album, The Slim Shady LP. In ’99, we saw this video from this young guy from Detroit named Eminem called “My Name Is”. It was a goofy video, but clearly you could see some talent. Furthermore we all know Dre doesn’t associate with just “good” emcees. While we saw and heard goofiness and somewhat childish rhymes, some were throwing him away, already labeling him as the next Vanilla Ice or another novelty white boy act. However, underground heads peeped a cut called “Just Don’t Give A F***” and those throw-away notions were taken back, quickly. “Just Don’t Give A F***” was raw, in-your-face, and filled with rewindable lyrical swordsmanship. This is what heads wanted, and needed, to hear from him. Soon after The Slim Shady LP was among us. Commercially, it did well within its first week, selling around 225,000 units – and it quickly went platinum within a two month period. Did the rest of the album hold up lyrically, with less of the zaniness we got from “My Name Is”? Let’s see, shall we? Lyrically, we knew this kid was somewhere else. We had never heard any Caucasian rhyme with this much wit, clarity, and razor sharpness, much less with this imagination and sick wordplay. Truly this dude was a diamond in the rough. Thematically, we heard a guy who’s life was drugs, dreams of killing his daughter’s mother, homophobia, and misogyny, but he made it all sound borderline comical. It’s like this Slim Shady persona was a sophomoric, juvenile version of himself turned all the way up. On cuts like “Role Model” and “Brain Damage”, he excuses himself from being someone one would ever want to be like, but instead learn from. Is he angry on here? Damn right he is, and on tracks like the aforementioned “Just Don’t Give A F***”, or others like “If I Had” and “My Fault” where he gives the middle finger to seemingly everyone and everything. He explores a humorous, yet dark, side of him with the Dre-assisted “Guilty Conscience”, where he plays the bad half of every situation, and does so in such tickling fashion, you almost forget his lyrics are pretty dark and violent-natured. He hits another level on the ominous “’97 Bonnie & Clyde” that has him and his then very young daughter Hallie Jade riding around with her mother presumably stuffed in a bag in the trunk about to get dumped over a bridge. It’s perverse, twisted, and maniacal, but it also got you talking. It was a fantasy he had of his daughter’s mother, Kim, when they were going through some highly tumultuous times. The track provided shock and awe, and if anyone can relate to shock and awe, it’s the almighty Doctor. When Eminem gets up with his tag team partner, a then relatively unknown named Royce Da 5’9″, they obliterate the cut “Bad Meets Evil” – we get to see how animalistic not just Em is, as Royce proved he can be a deadly as Shady can be. 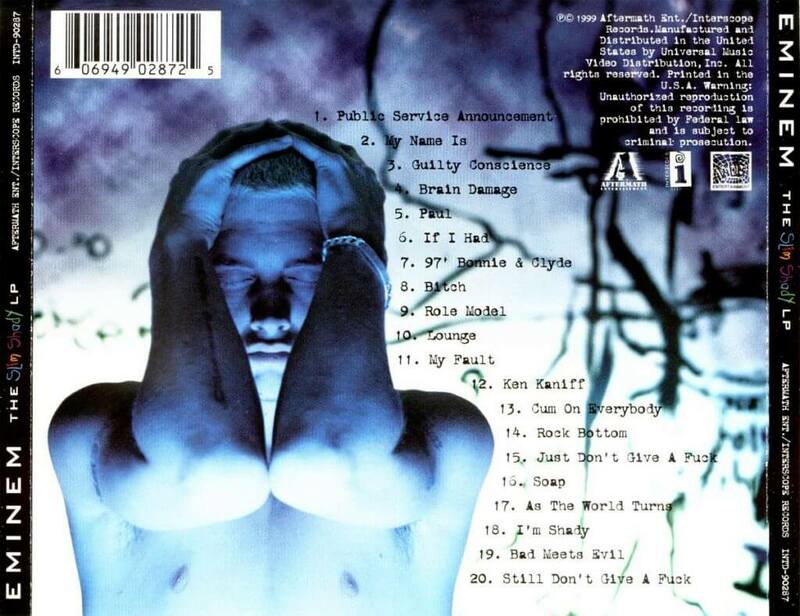 The Slim Shady LP was a drug-infested ride that marked the beginning of a legendary career for Marshall. His follow-up album, The Marshall Mathers LP, became one of the most commercially successful albums in modern music, and labeled as a true classic among Hip Hop aficionados, – and the follow-up The Eminem Show, hit almost as hard. From there, Em would have good and not so good moments from albums like Relapse, Encore, Recovery, Marshall Mathers LP 2, and the most recent Kamakazi. However, The Slim Shady LP was the album that really started it all for the man who would later refer to himself as the “Rap God”. For The Slim Shady LP, we salute Em for twenty years of relevancy.